The other day in the freezing weather I developed in itch for Ginger Nuts. My grandma used to love Ginger Nuts. They were her all-time, best-of-the-best, favourite biscuits. She'd dunk them in her tea to soften them up a bit, and to flavour the brew with their wonderful gingeriness, and all the while she'd offer careful advice about not leaving them in too long; that was the way to a horrible messy sludge in the bottom of the cup. Hot, steaming tea, the colour of creosote, and carefully dunked Ginger Nuts became a little afternoon ritual of ours. And in the cold, with hostile grey skies and nowhere to go, I had to scratch the itch. 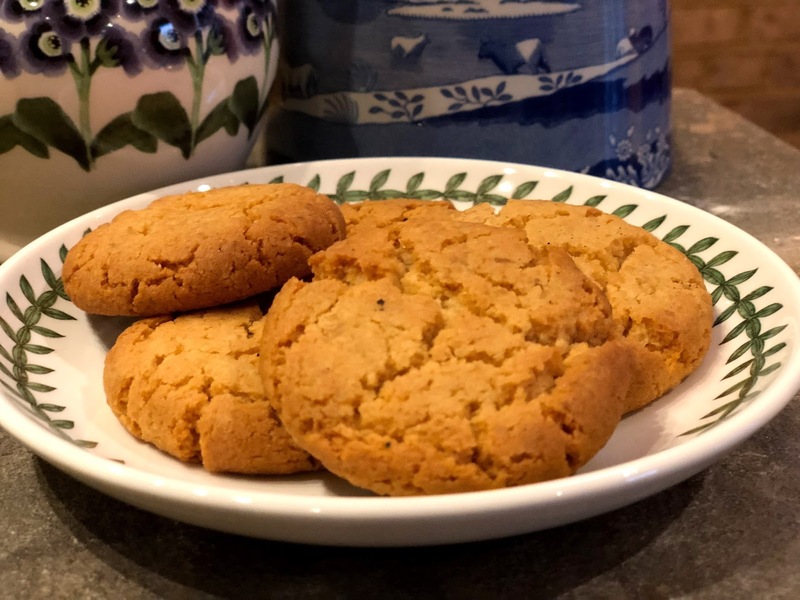 And so, I made these Ginger Nuts in honour of Granny J, because the truth is I think of her every time I eat one. Sieve flour and baking powder into a mixing bowl. Add the sugar, the ground ginger and the crystallised ginger and mix so that they are all evenly distributed. Add the butter and knead with your fingers until you get a bread-crumb consistency. Add the syrup, and mix well to make a crumbly dough that holds its shape when you squeeze it with your hands. Make a round cake shape with the dough. Cut it into 4 equal quarters and then cut those quarters into halves, and cut the halves of the quarters into halves. You should end up with 16 segments. When you've got your biscuits all sized up position them on a baking tray lined with baking paper allowing space between them as they will spread a little as they bake. Flatten them slightly with the palm of your hand so that they're about 1.5 cm thick. Pop them in the oven and bake for 10 to 12 minutes until they're golden brown. Leave them to cool and harden for a couple of minutes when you take them out of the oven, and then move them with a spatula to a wire cooler to cool down to room temperature. And finally enjoy with a nice strong brew and a good dollop of nostalgia!